The first right whale of the season has been spotted in Canadian waters after an unprecedented winter in which not a single calf was spotted. The first right whale of the season has been seen in Canadian waters after an unprecedented winter in which not a single calf was spotted. The Department of Fisheries and Oceans said in a tweet on Tuesday that the whale was spotted off the coast of eastern Cape Breton during an aerial survey. In the last year, at least 18 critically endangered North Atlantic right whales have been found dead off the coast of the U.S. and Canada. That represents about four per cent of the population. Scientists believe human activity, including shipping and fishing, are the primary cause. This year marks the first time there have been no right whale calves observed. Scientists expect to see mothers and calves making their way north toward Atlantic Canada by the end of February, but so far none has been seen. With no calves this year and only about 100 breeding females left in the population, there are concerns the whales could be 20 years from extinction. Closing some waters off the coast of New Brunswick to lobster fishing. An earlier start and end to the snow crab fishery in the southern Gulf of St. Lawrence. Fixed and temporary closures where whales are spotted. A 10-knot speed restriction earlier in the season for ships travelling in the western Gulf. The department said fishing will continue, but harvesters should be on alert for any changes should DFO decide there is a risk to the creatures. Prior to the department's update, six associations representing the Southern Gulf of St. Lawrence Mid Shore Fleet said statistics for the first 10 days of the fishery that started May 1 show the number of pots fished has increased by more than 50 per cent compared to 2016, while the total catch landed is down slightly at 4,354 tonnes compared to 4,964 tonnes in 2016. The groups said that indicates a rush to catch quota in light of a decision by DFO to shut down access to two major snow crab concentrations in fishing Area 12. The midshore fleet said that's forced 130 fishermen into "already exploited" fishing grounds outside the closed area. "What is happening is that you are diverting the effort outside of that zone and you are retarding the catch of the crab," Robert Hache, director-general of the Acadian Crabbers Association, said to The Canadian Press. 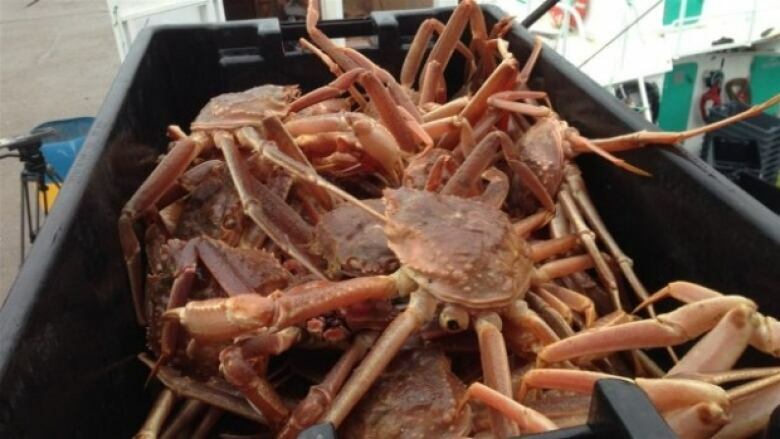 The snow crab groups said fishermen are now competing to catch an extra 20 to 30 per cent of the total allowable catch to compensate for the lack of access to the closed area. As of Tuesday, the federal department said 6,319 tonnes had been landed by traditional, First Nations and new-access fleets in designated areas of Canadian waters, including the Gulf. The snow crab season ends June 30. Hache said it would make more sense to have more widespread fishing during the month of May, to the benefit of fishermen and whales. He stressed fishermen aren't opposed to measures designed to protect right whales. "If we could have fished there [restricted areas] for the past two weeks ... we would have already probably doubled the landings that we have at this time, which would have meant the fishery would have finished earlier and the traps would have been taken out of the water earlier," he said. As things stand, Hache said there's an increased likelihood of the whales arriving when many pots will still be in the water. That would concentrate the risk. "They [DFO] are creating a trap for the whales that are coming in later on in the season with all the number of traps that will still be in the water because we will not have been able to fish quickly enough."